Namtrul Rinpoche aka Namtrul Rinpoché Jigme Phuntsok, Orgyen Namkha Lingpa or Pel Naym-me Orgyen Namkha Lingpa (1944-2011) was a charismatic contemporary tertön of eastern Tibet, the spiritual consort of Tare Lhamo, and a main holder of the Dudjom Tersar lineage. Namtrul Rinpoche was born in 1944. His father was Pouchong Namlo from the royal lineage of Mougpo Dong, his mother was called Getse Zadrog Kyi. He was recognized as an incarnation of Namkhé Nyingpo, of Apang Tertön and of the abbot of Nyenlung Monastery. He was also recognized by Jamyang Khyentse Chökyi Lodrö and Bairo Mingyour Yeshe Dorje as the reincarnation of Shouchen Namtrul Osel Rigpe Dorje. It is said that since he was very young, he showed natural compassion towards sentient beings and could not stand other kids killing insects. In 1952, when he was 8 years old, Namtrul Rinpoche was closely cared by Shouchen Kunzang Nyima. When he was 9 years old, oral stories recount that her mother came to see him, and that he announced she was going to die soon, which did happen very few days after. In 1957, he was ordained in Tagtse Samdroup Chökhor Ling monastery, and was cared by Shouchen Phendé Chökyi Nyima. In 1960, during a strong starvation in Tibet, it is said that Yeshe Tsogyal appeared to him and announced to him that she will never abandon him. At the end of the 1970’s, he met Tare Lhamo, with whom he had began a connection through a repeated exchange of love letters. During almost 20 years, Namtrul Rinpoche and Tare Lhamo went through all over Tibet to give empowerments and teachings, to the thousands who were gathered in many different monasteries. 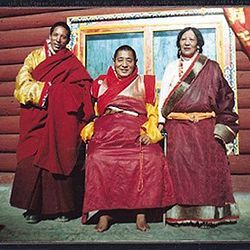 Together, Namtrul Rinpoche and Tare Lhamo revealed many termas, and they established a very close connection with Khenpo Jikme Phuntsok. 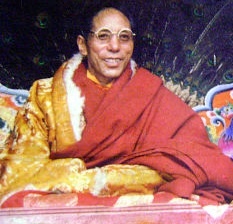 Later, Namtrul Rinpoche took charge of the monasteries of Tsida and of Nyenloung. Both Namtrul Rinpoche and Tare Lhamo gave empowerments to Dudjom Sangye Pema Zhepa Rinpoche. Namtrul Rinpoche passed away on November 6th, 2011. ↑ Pel Nyenlug Thekchen Chökhor Ling is a nyingma monastery from Golok. This page was last edited on 3 June 2016, at 14:27.